Do tigers have striped skin? Subject: Fw: Do tigers have striped skin? Tigers have striped skin not just striped fur. 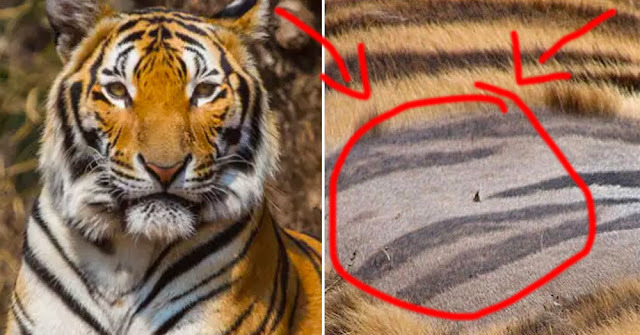 The stripes are like fingerprints and no two tigers have the same pattern. The species name Tigris is Greek for "arrow". ... Once a tiger has spotted its prey, it sneaks as close as possible to its victim. What color is the skin of a tiger? Although different species vary slightly, the base coat is generally a golden hue, the stripes ranging from dark brown or grey to black, and the underside of the tiger white. Interestingly, the skin of the tiger is also striped beneath the patterned fur. Why do Tigers have striped skin? A tiger's stripes help to break up the outline of its body and make it hard to see. They also look like shadows as the tiger stalks through long grass in the moonlight. Tigers have striped skin not just striped fur. 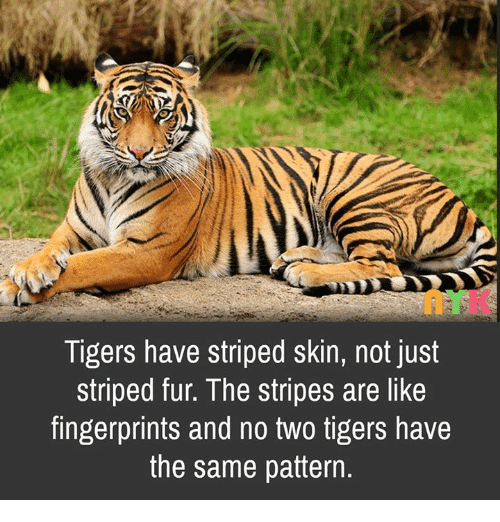 The stripes are like fingerprints and no two tigers have the same pattern. What color is a tiger's fur? Never Miss A Crazy Email! Don't be shy. Leave a comment below and tell the world what you think. Can you get addicted to your phone? Why do we yawn when not tired? Do naps make up for lost sleep? Why are wedding dresses white? My Crazy Email is a participant in the Amazon Services LLC Associates Program, an affiliate advertising program designed to provide a means for sites to earn advertising fees by advertising and linking to Amazon.com, Amazon.co.uk, Amazon.ca or other Amazon websites. If you have an interesting topic that you would like to share with the world go ahead and forward it to submit(@)mycrazyemail.com. And don't worry your privacy will always be protected.